Examples of branding and marketing. 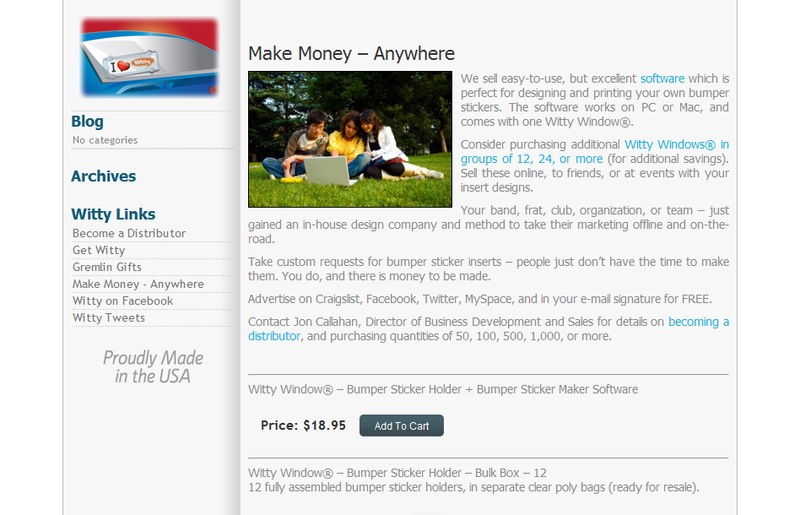 I redid this website in March, 2011 to match recent business cards and other printing that I designed. 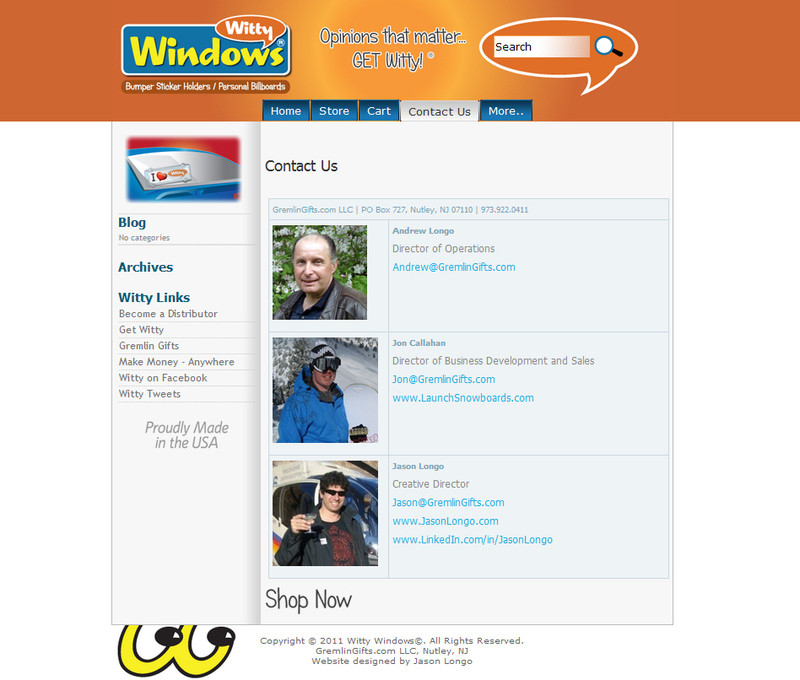 The site was moved from ProStores with PayPal Payments Pro to a WordPress self-hosted website. This essentially saved the client over $700 a year, without reducing functionality. Another benefit of the move and redesign is ease of editing, and ability to provide updates much more rapidly. The previous website did not provide such easy access to purchasing it's main product. That problem was eliminated on every page of the new design. 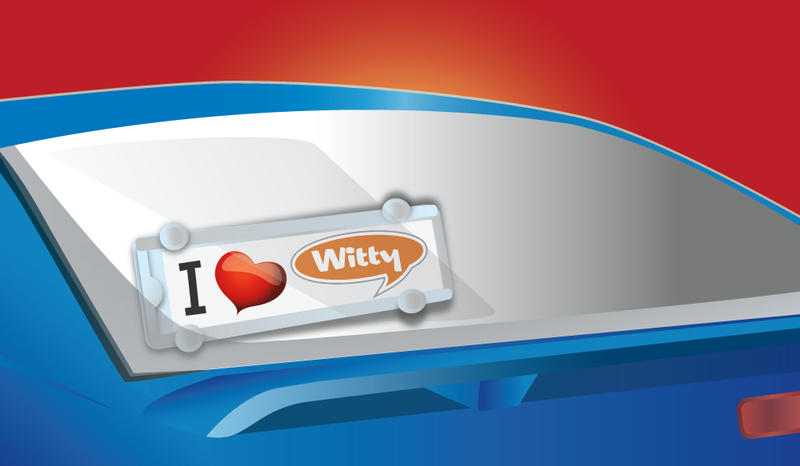 I made the illustration of the Witty Window product in Illustrator, for their business card project. 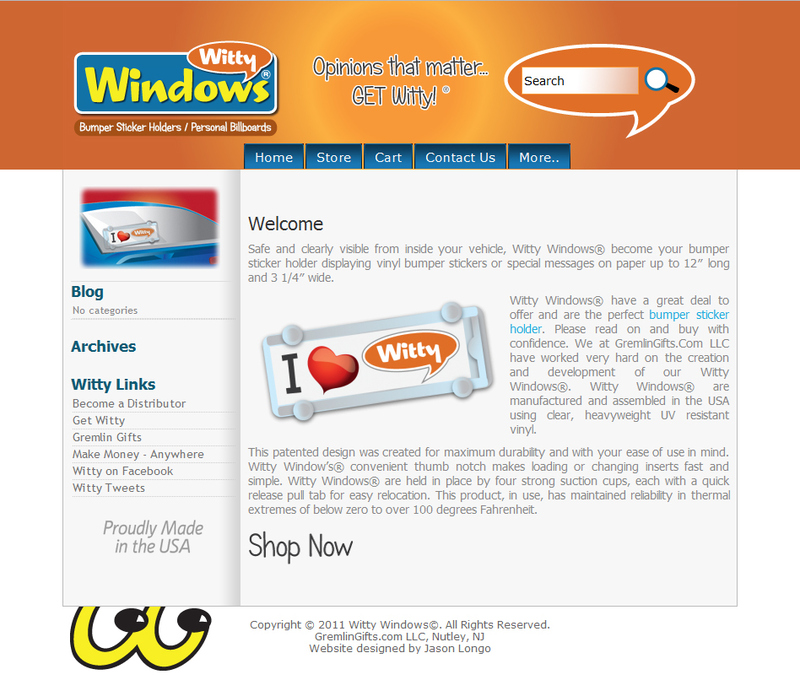 Below this content are shopping cart buttons to purchase various quantities/collections of the Witty Window bumper sticker holder. 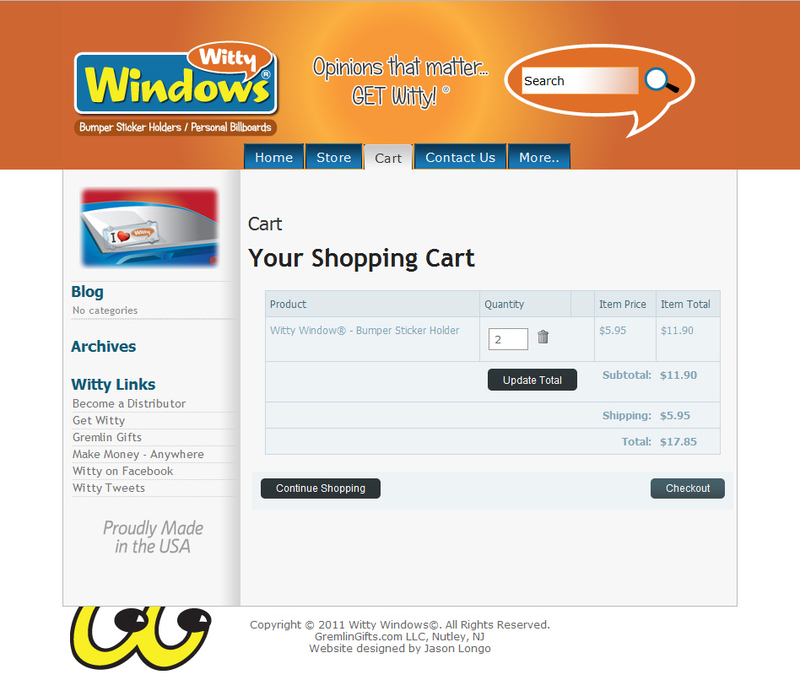 Screenshot shows a cart with two Witty Windows. It calculates shipping based on subtotal, and there are other back-end features which ensure accuracy. 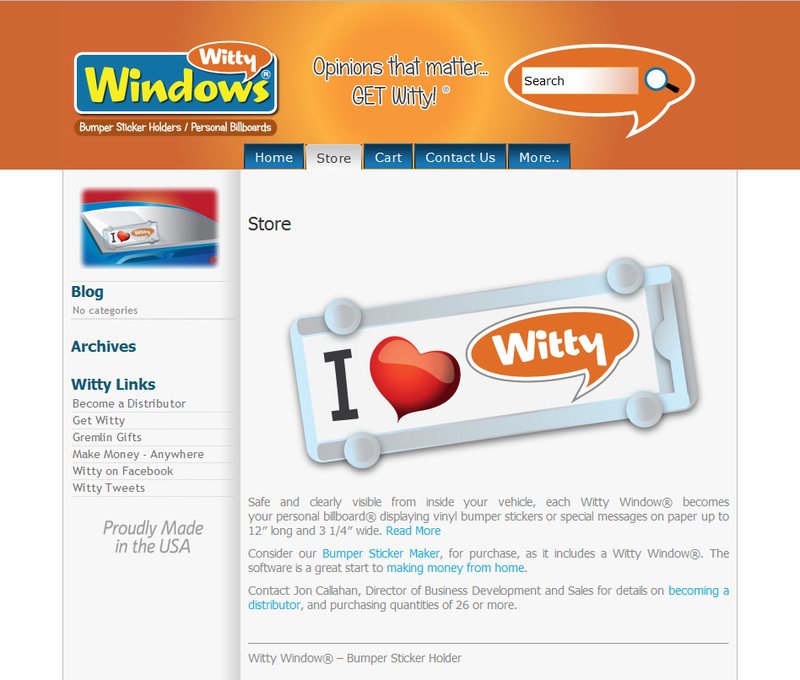 Content was borrowed mainly from GremlinGifts.com, but a Shop Now button was added to the footer. The third photo from the bottom is me - Creative Director. 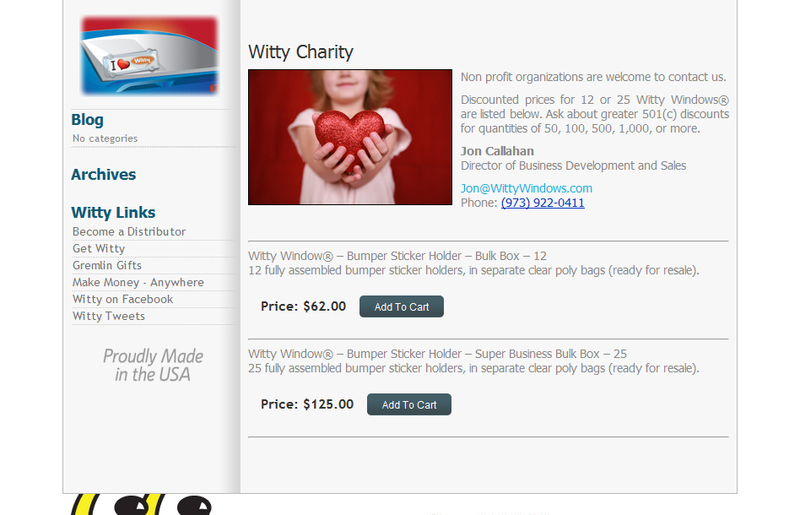 I decided to expand the website to include several pages for specific - potential buyers. As the company offers special volume discounts to non-profit organizations; it made sense for this to be the first special page. The photo was purchased at IStockPhoto.com. I decided to expand the website to include several pages for specific - potential buyers. As the company offers special volume discounts to political groups/politicians; it made sense for this to be the first special page. The photo was purchased at IStockPhoto.com. 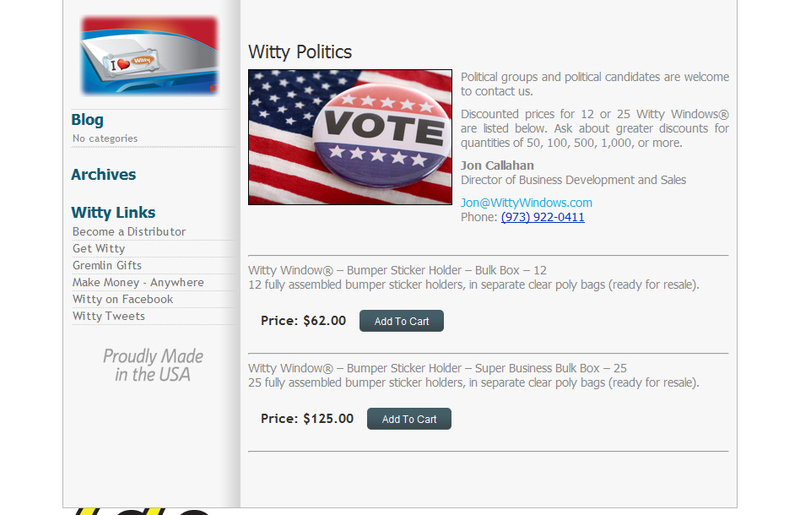 The company sells bumper sticker maker software, and bulk boxes of 12 or 25 holders. The combination of the two is the basis for a dorm-room or home business where the potential buyer creates bumper stickers on paper, either on demand, or through their own creativity. The holders and inserts can be sold or produced for sale. The photo was purchased at IStockPhoto.com. 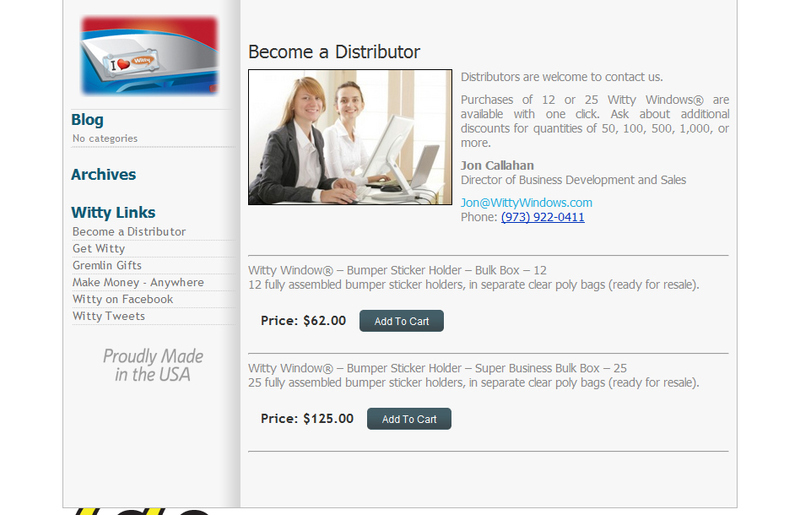 The company sells bumper sticker maker software, and bulk boxes of 12 or 25 holders. Quantities of 50, 100, 500, 1,000 or more are also available. The products are assembled and packed individually for resale. The page, and image target entrepreneurial young people. The photo was purchased at IStockPhoto.com. This version for the website is the same image, minus a lot of copy.